North of the islands in south-western Finland, in Satakunta, is a pre-cambrian sandstone deposit that is formed in the shallow sea around Pori after the rapakivi granite has settled. Some of these sandstones have similar signs of waves as is formed at the shallow sand beaches today. This is an example on how modern geological processes have functioned through out the geological history. Due to the horizontal layers of sandstone, the Pori surroundings are very flat. It is possible to view the layers of settled sandstone and signs of waves just below the dam of the hydro-electric power plant in Harjavalta. Elsewhere in Satakunta, the sandstones are often covered within loose soil. The sandstone can be also found in southern Finland, as boulders shifted by ice age glaciers. At the last larger volcanic event in Finland, magmas were again erupting from the mantel to the crust and crystallizing as Olivine diabases. 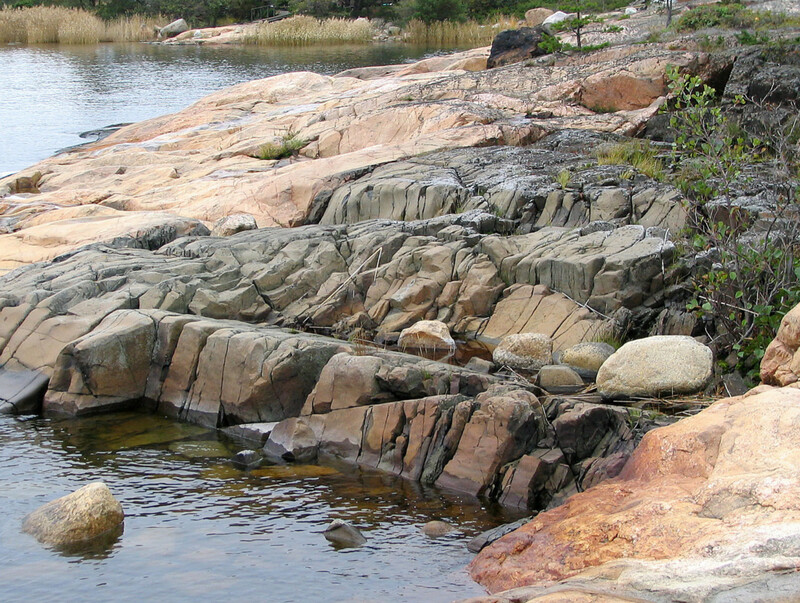 These very coarse-grained diabase rocks can be found for instance west of Pori on the camping are of Reposaari. Also the lighthouse-island of Säpi consists of Olivine diabases. Diabases are composed of olivine, pyroxene and plagioclase. Their structure, where slates of plagioclase have crystallized in random directions, while darker minerals fill the voids between the plagioclases, makes diabases durable. As dark rocks, they also store heat well and make great sauna stones.